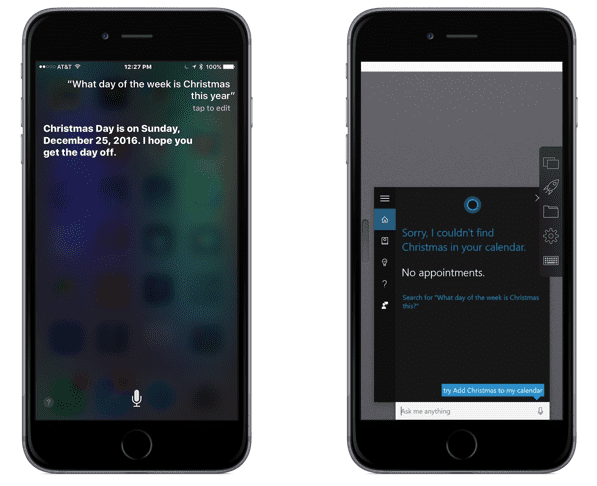 Siri vs. Cortana Shoot-out Revisited – despite one disappointing setback, Cortana leaps ahead! Since my first Siri vs. Cortana shoot-out, Apple has revised Siri, Microsoft has revised Cortana, and Microsoft has released Cortana for the iPhone. Sounds like time for another shoot-out. All the tests were on an iPhone 6 Plus running iOS 9.2.1. Cortana was running in Windows 10 Professional, build 10586, on a Retina MacBook Pro running Parallels Desktop 11.1.2 build 32408 on El Capitan 10.11.3. 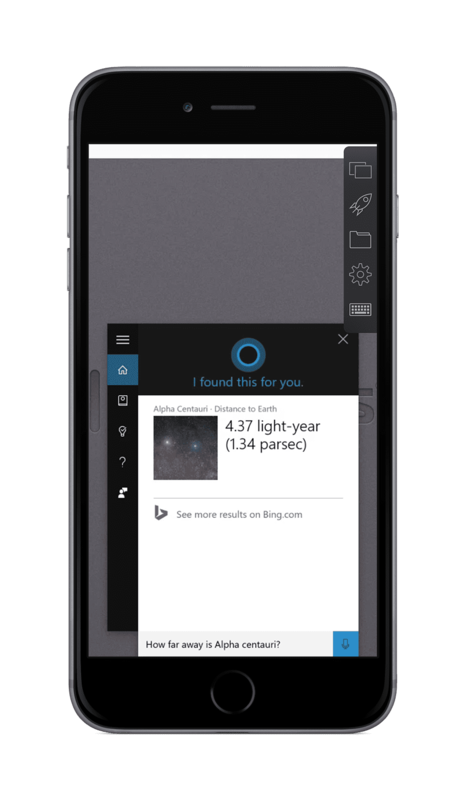 Parallels Access version 3.0.2 was used to access the Windows 10 version of Cortana from the iPhone 6 Plus. The iOS version of Cortana was 1.4.0. If the query failed on the first attempt, I asked the query two more times. A zero “no response” rating was only given if the assistant failed on all three attempts. I won’t keep you in suspense any longer. Although Siri won the last shoot-out by the slimmest of margins, Cortana pulled ahead in this shoot-out redo, despite one major disappointing new setback by Cortana. 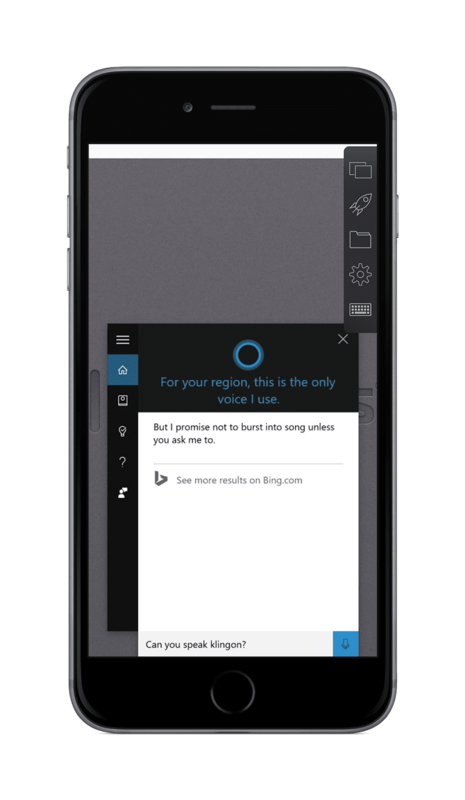 Cortana on iOS did even better than Cortana on Windows 10, much to my surprise! My revised scores are shown in Table 2. 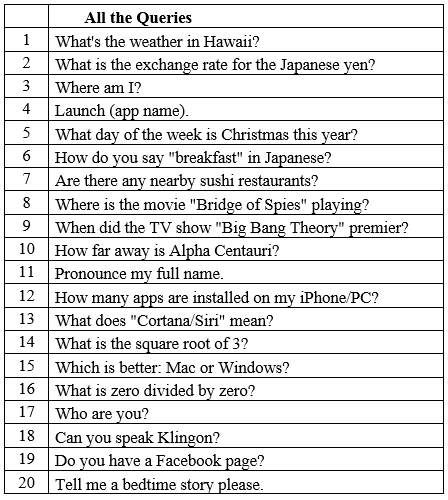 Christmas this year (Query #5): Siri adds a litle joke, and Cortana still misses this query completely. 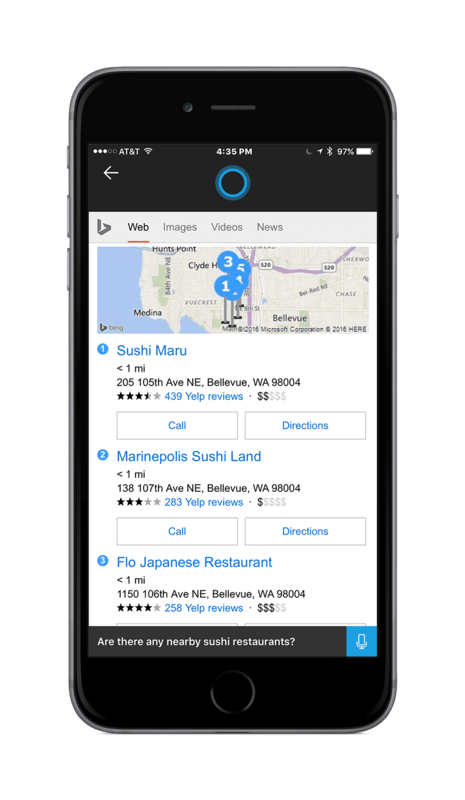 Nearby sushi restaurants (Query #7): iOS Cortana gives a really great answer, properly formatted for the iPhone screen. 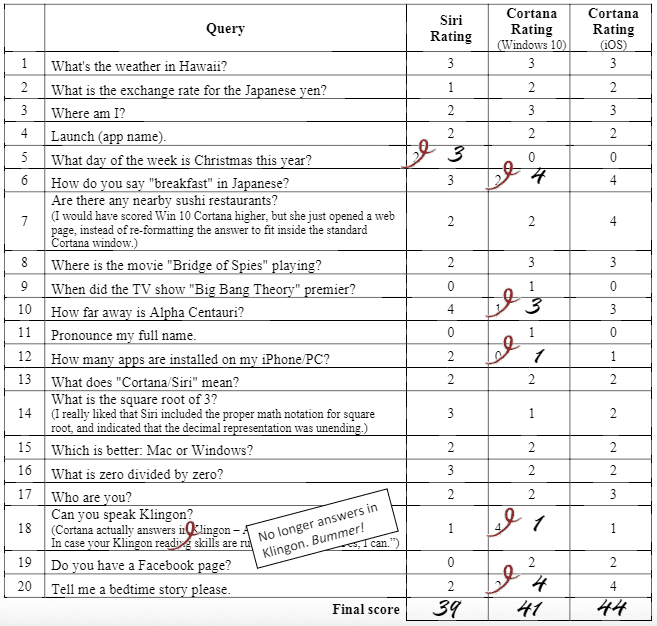 Alpha Centauri (Query #10): Both Siri and Cortana give great answers, but while Cortana presents the correct answer in text (1.34 parsecs), the vocal answer is a surprising “1.34 kilometers”. 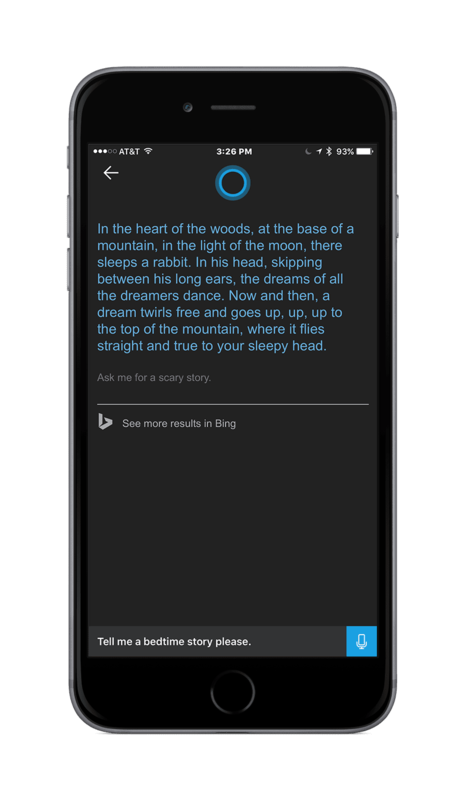 Bedtime story (Query #20): Cortana on both platforms presents an excellent bedtime story. Klingon (Query #18): Cortana used to respond in Klingon, which was a real LOL moment, which I showed to many of my fellow Star Trek friends. Although it is of no real practical value, this response gave Cortana a real personality and made Microsoft appear less stodgy. Sadly, this is now gone. So disappointing! What do you think, do any of these changes affect how/if you use a digital assistant? 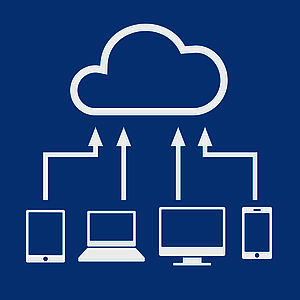 Share your thoughts with us in a comment or reach out to us on Facebook or Twitter.